Insulin therapy in patients with type 2 diabetes mellitus is accompanied by weight gain characterised by an increase in abdominal fat mass. The expansion of adipose tissue mass is generally paralleled by profound morphological and inflammatory changes. We hypothesised that the insulin-associated increase in fat mass would also result in changes in the morphology of human subcutaneous adipose tissue and in increased inflammation, especially when weight gain was excessive. We investigated the effects of weight gain on adipocyte size, macrophage influx, and mRNA expression and protein levels of key inflammatory markers within the adipose tissue in patients with type 2 diabetes mellitus before and 6 months after starting insulin therapy. As expected, insulin therapy significantly increased body weight. At the level of the subcutaneous adipose tissue, insulin treatment led to an influx of macrophages. When comparing patients gaining no or little weight with patients gaining >4% body weight after 6 months of insulin therapy, both subgroups displayed an increase in macrophage influx. However, individuals who had gained weight had higher protein levels of monocyte chemoattractant protein-1, TNF-α and IL-1β after 6 months of insulin therapy compared with those who had not gained weight. We conclude that insulin therapy in patients with type 2 diabetes mellitus improved glycaemic control but also induced body weight gain and an influx of macrophages into the subcutaneous adipose tissue. In patients characterised by a pronounced insulin-associated weight gain, the influx of macrophages into the adipose tissue was accompanied by a more pronounced inflammatory status. The study was funded by European Foundation for the Study of Diabetes and the Dutch Diabetes Research Foundation. The online version of this article (doi: 10.1007/s00125-013-3018-6) contains peer-reviewed but unedited supplementary material, which is available to authorised users. Insulin therapy is frequently needed to achieve adequate glycaemic control in patients with type 2 diabetes mellitus yet often results in undesirable weight gain. Although values differ and studies are generally of limited duration, the estimated weight gain during the first year of insulin therapy ranges from approximately 2 to 6 kg . This weight gain is paralleled by an increase in abdominal fat mass . When obesity develops, the adipose tissue undergoes distinct morphological changes including adipocyte enlargement and macrophage influx . In adipose tissue in obese individuals, macrophages may be arranged in so-called crown-like structures (CLSs) that surround dysfunctional or dying adipocytes  and are characterised as having a more pro-inflammatory nature than individual macrophages dispersed throughout the adipose tissue . In general, these changes lead to a more pronounced inflammatory status of the adipose tissue that is reflected by an increased secretion of pro-inflammatory mediators by the adipose tissue and a reduction in secretion of the insulin-sensitising protein adiponectin . The enhanced inflammatory status of the adipose tissue is thought to contribute to the development of systemic insulin resistance that may eventually evolve into type 2 diabetes. Although inflammatory changes in the adipose tissue are well described in individuals who develop obesity, it remains unknown whether similar changes in the morphological and inflammatory characteristics of subcutaneous adipose tissue also occur in patients with type 2 diabetes who start insulin therapy and subsequently gain weight. An emerging body of evidence suggests that insulin suppresses the inflammatory process, not only through preventing hyperglycemia, but also by modulating key inflammatory molecules. Studies that have examined the effects of (intensive) insulin therapy on immune function and inflammatory factors have shown that the levels of systemic pro-inflammatory cytokines decrease after administration of insulin [6, 7]. One may hypothesise that the anti-inflammatory effects of insulin at the systemic level may be counteracted by the pro-inflammatory changes associated with an increased fat mass. This may be particularly true in those who gain most weight. To test this hypothesis, we investigated changes in the morphological characteristics of adipose tissue, macrophage influx, and mRNA expression and protein levels of key inflammatory markers within the adipose tissue in patients with type 2 diabetes mellitus before and 6 months after the start of insulin therapy. We also assessed whether potential changes were related to excessive weight gain. This study was part of a large prospective, multicentre, observational study aimed at identifying the determinants of insulin-induced weight gain in type 2 diabetes (abstract EASD no. 942; 2012, Berlin; ClinicalTrials.gov NCT00781495, n = 65 patients). In short, the patients recruited were those with type 2 diabetes who failed therapy with oral glucose-lowering agents and/or dietary modifications and were started on insulin therapy. All patients were treated according to local guidelines. The majority of the patients used an oral glucose-lowering agent (metformin and/or sulfonylurea derivative) throughout the study. To determine the impact of a high weight gain on the inflammatory status of the adipose tissue, we divided the study population into two subgroups of patients: ‘gainers’ (patients displaying >4% weight gain after 6 months of insulin therapy; n = 10) and ‘non-gainers’ (patients with a weight gain ≤4%; n = 33) [1, 8]. Furthermore, we included a matched non-diabetic obese subgroup (BMI 27–43 kg/m2, age 40–70 years; n = 42) in order to compare the morphological characteristics of adipose tissue, macrophage influx and protein levels of key inflammatory markers. Exclusion criteria were earlier use of insulin, other types of diabetes, including steroid-induced diabetes, evidence of psychiatric, renal, cardiovascular, liver or other diseases and use of medication (prednisone) that might influence the study results. Before and after 6 months of insulin treatment, BMI, waist circumference and skinfold thickness were measured. Body composition was assessed using formulas described by Jackson and Pollock [9, 10]. At baseline (i.e. prior to insulin treatment) and after 6 months of insulin therapy, subcutaneous adipose tissue biopsies were obtained under local anaesthesia from needle biopsies performed 6–10 cm lateral to the umbilicus after an overnight fast. The same measurements were performed in the non-diabetic obese participants. The study protocol was approved by the local ethical committee. All study participants provided written informed consent. Plasma glucose concentration and HbA1c level were measured by standard laboratory methods. Furthermore, we measured plasma adiponectin, leptin, IL-8 and high sensitive C-reactive protein (R&D systems, Minneapolis, MN, USA). The morphometry of individual fat cells was assessed using digital image analyses as previously described . For each participant, the adipocyte cell diameters of all the fat cells in five to ten microscopic fields of view were counted and measured. On average, approximately 700 fat cells (range 150–1,500) were measured per specimen. The distribution of adipocyte cell size was expressed as the ratio of small (≤50 μm) to large (≥100 μm) adipocytes . For detection of macrophages, adipose tissue sections were incubated with a CD68-monoclonal antibody (Clone EBM11, Dako, Denmark). The percentage of macrophages was expressed as the total number of CD68-positive cells divided by the total number of adipocytes counted in ten random microscopic ×100 fields of view. A CLS was defined as an adipocyte surrounded by at least three macrophages . Total RNA was extracted from subcutaneous adipose tissue as previously . cDNA synthesis was performed using iScript (Bio-Rad Laboratories, Hercules, CA, USA). Gene expression was determined by real-time PCR analysis (Applied Biosystems, Warrington, Cheshire, UK). Gene expression results were normalised to β-2-microglobulin (β2M) levels. To compare gainers and non-gainers, results from a maximum of ten individuals are presented for gainers and from 33 individuals who were part of the non-gainers group. The genes and primer sequences used in this study are listed in ESM Table 1. Protein levels within the adipose tissue biopsies were measured by Luminex fluorescent bead human cytokine immunoassays in line with the manufacturer’s instructions (Milliplex MAP; Millipore, Billerica, MA, USA). Briefly, adipose tissue lysates were prepared using the Milliplex map lysis buffer (Millipore), and protein concentrations of IL-1β, IL-6, IL-8, TNF-α, leptin (LEPTIN), adiponectin (ADIPONECTIN), monocyte chemoattractant protein-1 (MCP-1), resistin (RESISTIN) and plasminogen activator inhibitor-1 (PAI-1) were determined. To measure the protein levels in adipose tissue using Luminex beads, 30% lysates of each sample (300 mg of adipose tissue in 1,000 μl of lysis buffer) were prepared. Protein concentrations of the various samples were measured using a bicinchoninic assay. Equal amounts of protein (28.2 μg) were analysed using a Bio-Plex system (Bio-Rad). In comparing gainers and non-gainers [1, 8], results from a maximum of ten individuals are presented for gainers and from 33 individuals who were part of the non-gainers group. A maximum of 37 non-diabetic obese participants are presented. Missing values were due to technical issues or measurements below the detection level of the Luminex assays. Descriptive patient characteristics and other variables are displayed as mean ± SD unless otherwise indicated. Differences after insulin treatment were studied using the Student’s paired t test, Wilcoxon signed-rank test and Mann–Whitney U test as appropriate. The χ 2-square test was used to compare dichotomous variables. All calculations were performed using SPSS 20.0 for Windows (SPSS, Chicago, IL, USA). Two-tailed p values <0.05 were considered significant in all statistical comparisons. A total of 43 patients with type 2 diabetes who started insulin therapy underwent paired adipose tissue biopsies. The baseline anthropometric and laboratory characteristics of the study group are shown in Table 1. After 6 months, 25 patients (58%) used basal insulin only, four patients (9%) were using biphasic insulin and 14 patients (33%) were on basal and bolus insulin. At 6 months, patients were using 0.37 ± 0.24 U insulin/kg body weight. Fifty-eight per cent of the patients were injecting their insulin into the thigh area, whereas 42% were injecting insulin into the abdomen. Of those patients injecting insulin into the thigh area at the initiation of insulin therapy (n = 26; 61%), 13 patients (30%) were still injecting insulin only into the thigh area at 6 months. Insulin treatment increased body weight from 88.1 ± 18.1 to 89.3 ± 18.0 kg (range −4.5 to 7.4 kg; p < 0.05). In addition, BMI, waist circumference and calculated body fat mass increased significantly. HbA1c levels dropped from 8.7 ± 1.1% (72 ± 12 mmol/mol) to 7.4 ± 1.0% (57 ± 11 mmol/mol) (p < 0.05). Figure 1a–b shows a histological overview of the adipose tissue sections before and after the start of insulin therapy. Insulin therapy had no effect on adipocyte cell diameter (69.5 ± 7.7 μm and 70.7 ± 6.9 μm at baseline and 6 months, respectively; p = 0.43). Similarly, insulin did not affect the size distribution of the adipocytes (Fig. 1c) or the percentage of small adipocytes (18.3 ± 10.1% at baseline vs 17.7 ± 10.6% after insulin; p = 0.82) or large adipocytes (9.7 ± 8.3 vs 9.8 ± 8.1%; p = 0.95). The adipocyte cell size was similar compared with that of non-diabetic obese individuals (Electronic supplementary material [ESM] Table 2 and ESM Fig. 1a). The influx of CD68-positive cells per adipocyte was higher in patients with type 2 diabetes mellitus compared with non-diabetic participants (ESM Fig. 1b). Strikingly, insulin therapy increased macrophage influx even further, as shown by the number of CD68-positive cells per adipocyte (0.07 ± 0.06 vs 0.16 ± 0.09; p < 0.001; Fig. 2a–f and ESM Fig. 1b). Males and females displayed a similar increase in the influx of CD68-positive cells per adipocyte (males, 0.1 ± 0.1; females, 0.1 ± 0.1; p = 0.38). The increase in CD68-positive cells before and after insulin treatment was not correlated with the degree of weight gain in our population, suggesting that insulin therapy, independently of weight gain, increases the number of macrophages within the adipose tissue (see below). Noticeably, the number of CLSs present in the subcutaneous adipose tissue did not change significantly from before to after 6 months of insulin therapy (30% vs 37%; p = 0.65). The degree of macrophage influx was independent of the insulin injection site. The degree of influx of macrophages into the adipose tissue, as measured by immunohistochemical staining, is mirrored by a similar trend in the mRNA expression of the macrophage-specific markers F4/80 and CD38 (ESM Fig. 2). Since an enhancement in macrophage influx into adipose tissue is known to increase the inflammatory state of the adipose tissue, we set out to measure the changes in mRNA levels of key adipocytokines within adipose tissue biopsies. After 6 months of insulin treatment, mRNA expression levels of glucose transporter type 4 (SLC2A4) and IL6 were significantly increased, whereas the gene expression levels of peroxisome proliferator receptor gamma (PPARG), adiponectin (ADIPOQ), monocyte chemoattractant protein-1 (CCL2) and IL8 were not changed significantly (Fig. 3a). The influx of macrophages into the adipose tissue may also aid remodelling processes that may occur to accommodate the expansion of the adipose tissue mass upon insulin-associated weight gain. Hence, we measured the expression levels of several genes related to adipose tissue remodelling. As shown in ESM Fig. 3, none of the gene expressions had changed significantly after 6 months of insulin therapy. To more extensively characterise the inflammatory status of the adipose tissue before and after 6 months of insulin therapy, the protein levels of various inflammatory adipokines including IL-1β, IL-6, IL-8, active PAI-1, TNF-α and MCP-1 were determined in adipose tissue. Patients with type 2 diabetes have higher protein levels of IL-8, MCP-1, PAI-1 and resistin within the subcutaneous adipose tissue compared with non-diabetic obese individuals (ESM Fig. 4). Noticebly, adipocyte size was similar between the two study populations, whereas the influx of macrophages was enhanced in patients with type 2 diabetes. As shown in Fig. 3b, there was no significant change in protein levels of leptin and resistin after 6 months of insulin treatment. In addition, adipose tissue levels of the various pro-inflammatory mediators in adipose tissue after 6 months of insulin treatment were unchanged (Fig. 3c). It has been unknown whether insulin and weight gain have an impact on circulating plasma markers. Therefore, we collected plasma at baseline and after 12 months of insulin treatment (as part of the original study). Circulating leptin levels significantly increased after insulin therapy. The other circulating markers did not change significantly (ESM Fig. 5a). It is a well-known fact that weight gain favours enlargement of the adipocytes and a shift towards a more pro-inflammatory status of the adipose tissue . Although 6 months of insulin therapy significantly enhanced body weight within our study population, a pronounced interindividual variation was observed. Therefore, we divided the group into two subgroups of patients, ‘gainers’ (patients displaying >4% weight gain after 6 months of insulin therapy; n = 10) and ‘non-gainers’ (patients with weight gain ≤4%; n = 33), to compare the effects of high weight gain with those of no or limited weight gain on the inflammatory status of the adipose tissue. The baseline characteristics of non-gainers and gainers are presented in Table 2. At baseline, the body weight of the gainers was significantly less than that of the non-gainers. The mean weight gain for gainers was 4.7 ± 1.5 kg, compared with 0.09 ± 2.3 kg (p < 0.001) for non-gainers, and the insulin dose at 6 months was 45 IU (0.57 ± 0.37 U insulin/kg body weight) in gainers and 29 IU (0.31 ± 0.15 U insulin/kg body weight) in non-gainers (both variables p < 0.05). The change in glycaemic control (HbA1c) was –1.79% (−2 mmol/mol) vs –1.04% (−1.0 mmol/mol) in gainers and non-gainers, respectively (p = 0.11). There was no significant increase in adipocyte cell size in the two groups (65.8 ± 7.0 to 67.5 ± 6.9 μm vs 70.6 ± 7.6 to 71.6 ± 6.7 μm, in gainers vs non-gainers, respectively; both p = 0.50 for the difference in adipocyte cell size within the subgroup). Interestingly, the number of macrophages, quantified by the number of CD68-positive cells, in the adipose tissue was significantly raised in both groups after 6 months of insulin therapy (Fig. 4a), indicating that the influx of macrophages was independent of weight gain. No significant changes in gene expression levels were observed when comparing gainers and non-gainers (Fig. 4b). However, protein levels within the adipose tissue displayed significant differences between gainers and non-gainers. Protein levels of MCP-1, TNF-α and IL-1β significantly increased in gainers compared with non-gainers (Fig. 4d), suggesting that pronounced insulin-associated weight gain might promote a more pro-inflammatory status of the adipose tissue that is independent of the absolute number of macrophages. When comparing circulating hormones and inflammatory markers in non-gainers vs gainers, we observed in gainers a significantly larger decrease in adiponectin levels and a significant larger increase in leptin levels (ESM Fig. 5b). In the present study, we demonstrated that 6 months of insulin therapy per se leads to an increase in the influx of macrophages into the subcutaneous adipose tissue in patients with type 2 diabetes mellitus, an effect that is independent of the level of weight gain. However, the subgroup that gained a more pronounced (>4%) amount of body weight showed an increased inflammatory status of the adipose tissue as reflected by an increase in the levels of pro-inflammatory cytokines (MCP-1, TNF-α and IL-1β) in the adipose tissue. The mean insulin-associated weight gain in this study equalled 1.2 kg after 6 months, with a considerable interindividual variation. Glycaemic control significantly improved but HbA1c levels at 6 months of insulin therapy were suboptimal. These changes in body weight and glycaemic control reflect real-life clinical practice outcomes. Insulin-associated weight gain leads to an increase in fat mass. 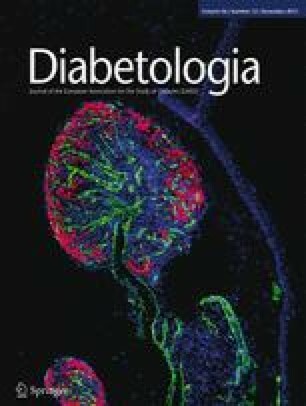 Interestingly, despite a lower total adipose tissue mass in patients diagnosed with diabetes compared with obese non-diabetic subjects (19 kg vs 22 kg, respectively), the adipocyte cell size in the subcutaneous depot tends to be higher in the presence of type 2 diabetes (70 μm vs 67 μm, respectively). Hence, this observation suggests that the presence of type 2 diabetes inflicts adipocyte hypertrophy possibly via insufficient adipocyte differentiation, and thereby limits proper storage in the subcutaneous fat depot. Although the development of obesity and weight gain induces an enlargement of subcutaneous adipocyte cells , no significant increase in adipocyte cell size after 6 months of insulin treatment was observed within our study population. This may be explained by the relatively moderate weight gain observed after 6 months of insulin therapy, which was probably too small to affect adipocyte cell size. It may also be envisioned that insulin induces the differentiation of new adipocytes  and thereby increases storage capacity without any change in adipocyte size. Changes in the inflammatory nature of the adipose tissue, including the influx of macrophages and altered levels of adipocytokines, rather than changes in adipocyte morphology are more important consequences of insulin-associated weight gain. Indeed, 6 months of insulin therapy led to a significant increase in the number of macrophages in the subcutaneous adipose tissue. The degree of macrophage influx was, however, independent of the level of weight gain, and the enhanced number of macrophages present in the adipose tissue was not accompanied by an upsurge in inflammatory status as the levels of various inflammatory adipokines within the adipose tissue were unaltered. These results suggest that the influx of macrophages upon insulin therapy serves a different purpose. A potential explanation for this phenomenon may involve the tissue remodelling function of macrophages [16, 17]. Macrophages are not only capable of mediating inflammatory responses, but also aid remodelling processes that may occur to accommodate the expansion of adipose tissue mass upon insulin-induced weight gain. However, the expression levels of genes related to adipose tissue remodelling, including those for PAI-1, TIMP-1 (tissue metallopeptidase inhibitor 1), matrix metalloproteinase-2 (MMP-2), MMP-3 and MMP-11 [18, 19, 20], were not significantly changed. Although weight gain might lead to an upregulation of the genes related to angiogenesis and extracellular matrix remodelling , our results suggest that insulin-induced weight gain exerts different effects on extracellular matrix remodelling. Interestingly, lipolysis has been shown to promote the influx of macrophages into adipose tissue that function to prevent excessive spill-over of non-esterified fatty acids into the circulation . As insulin inhibits lipolysis, the influx of macrophages upon initiation of insulin therapy appears to be somewhat counterintuitive. However, the insulin-mediated influx probably occurs independently of lipolysis and reflects the tissue-remodelling action of the macrophages. Whether insulin directly affects the influx of macrophages into adipose tissue or exerts its effects via indirect mechanisms that ultimately lead to an enhanced number of adipose tissue macrophages remains to be determined. Finally, the influx of macrophages into the adipose tissue may be a direct result of injecting insulin into the abdomen. However, we did not observe a difference in the influx of macrophages into the adipose tissue between patients injecting insulin into the thigh area compared with those who injected insulin into the abdomen (data not shown), rendering any direct effects of insulin or its injection site on the influx of macrophages unlikely. Although no effects on inflammation were observed in our total study population, a classification of our patients based on the degree of weight gain did reveal interesting differences. Whereas both non-gainers and gainers demonstrated a significant increase in macrophage influx into the adipose tissue, the gainers displayed an increase in pro-inflammatory cytokine production (MCP-1, IL-1β and TNF-α) after 6 months of insulin treatment compared with non-gainers. These results imply that, in gainers, the influx of macrophages is paralleled by an enhancement of the inflammatory status of the adipose tissue. As the total number of macrophages present after 6 months of treatment did not differ between the subgroups, it can be suggested that the phenotype of the macrophages is more pro-inflammatory, the adipocytes themselves are more inflamed, or other immune cells have infiltrated the adipose tissue in participants who gained over 4% of body weight. Although various reports have suggested that insulin suppresses inflammatory processes (at least systemically) [6, 7], more excessive weight gain after the start of insulin therapy may overrule any anti-inflammatory actions of insulin. Even in the absence of weight gain, insulin will have a direct effect on adipocytes as well as indirect effects through, for example, altered levels of circulating nutrients and hormones. Interestingly, only serum leptin increased significantly after insulin treatment. It can be envisioned that the effects observed after the start of insulin therapy are primarily a result of the direct effects of insulin and not indirect consequences of a change in circulating factors. Remarkably, the change in the number of adipose tissue macrophages upon insulin therapy is not translated into a systemic enhancement of inflammatory status. Our study has several limitations. First, the analyses were done using the subcutaneous fat tissue compartment and do not necessarily implicate similar changes in other fat compartments. However, most studies, including our own, have found that inflammatory changes in the visceral adipose tissue are mirrored by similar changes in subcutaneous adipose tissue . In addition, the intake and energy expenditure of the patients studied was partly unknown and may have affected the degree of overweight and adipose tissue inflammation [24, 25]. The strength of our study includes the extensive phenotyping of over 40 participants and careful pair-wise analysis of subcutaneous adipose tissue morphology and inflammatory changes. In addition, the determination of protein levels in adipose tissue has, to our knowledge, not previously been applied and yields more valuable information concerning adipose tissue function than measurements of mRNA expression levels and circulating protein concentrations. In conclusion, our results demonstrate that 6 months of insulin treatment lead to a significant influx of macrophages in patients with type 2 diabetes. This effect is independent of weight gain. However, pronounced insulin-associated weight gain (>4%), is paralleled by pro-inflammatory changes in the subcutaneous adipose tissue. Furthermore, gainers showed a higher increase in insulin dose compared with non-gainers, suggesting that a concomitant body weight gain and a shift towards a more pro-inflammatory profile of the adipose tissue might be associated with insulin resistance. The systemic anti-inflammatory effects of insulin (therapy) might be, at least partially, offset by the pro-inflammatory changes associated with an increased fat mass. Funding was received from the European Foundation for the Study of Diabetes and the Dutch Diabetes Research Foundation. HJJ and RS researched the data and wrote the manuscript. GMMV and CJT reviewed and edited manuscript. JvD, JvdL and AH contributed to discussions and reviewed and edited the manuscript. All authors were responsible for the conception and design of the manuscript, drafting the article and revising it critically for important intellectual content. All authors approved the version to be published.